With the announcement that Iran launched its own satellite last night came renewed suspicion that its intentions in space are less than honorable. In a closed society such as Iran one can never know if the public portrayal of national pride resulting from putting a small satellite into orbit is a cause for recognition of a significant technical achievement or a cause for concern that it is a nation harboring intentions of using rocket technology as a weapon of war. The launch of the Omid satellite which translates to “Hope” was timed to coincide with the Iranian Revolution thirty-years ago. That revolution which overthrew the pro-western Shah moved Iran to the list of countries that would seek extremes to execute on its disdain for non-Islamic neighbors, the United States and European countries that have stood against it. The Omid was launched on Iran’s Safir-2 two-stage rocket with a range of 150 to 250 miles. The launch was confirmed by both American and European Defense Agencies as well as Israeli Space Agency officials. The Iranian Government stated that the payload was a communications satellite although the altitude this rocket is capable of achieving is far to low to put a satellite into a more useful geosynchronous orbit. While the launch was confirmed the release of a satellite into orbit had not. The previous statements and actions of Iran compel us to look with skepticism upon Iranian President Ahmadinejad when he stated that “The launch was intended to be a message of peace and friendship to the world” - “We need science for friendship, brotherhood and justice”. In listening to Ahmadinejad we must heed the words of former American President Ronald Reagan when he said “trust, but verify”. The words “necessity are the mother of invention” are true and history has taught us that countries that seek to carry out policies of terror and aggression will use any means at their disposal to do so. While we hope that the words of Ahmadinejad are true the simplest way for Iran to advance its peaceful use of space is to allow team of Russian, European, Chinese and American observers and technicians to monitor the program with unrestricted access to construction, technology, operations, assembly and storage. If the Iranian’s don’t agree to oversight then we must assume that their intentions in space will follow the same ideological path that they have followed here on earth. We need only remember a time sixty-years ago when a group of engineers that sought to put men into space created a technology that was in turn used by another group of ideological leaders to create terror and destruction. 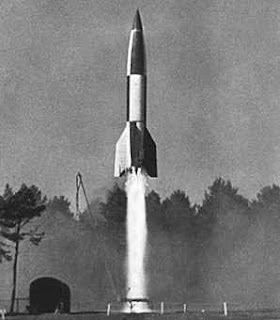 The V-2 was a first step in space that became the start of the use of rockets to wage war and later weapons to ensure a peace between world powers. While the threat of nuclear warheads sitting atop intercontinental ballistic missiles has kept the peace between the world’s major powers the use of such rockets by smaller countries is more threat than peacekeeper. Some analysts have argued that the two-stage Safir-2 with a solid rocket first stage and liquid fueled second stage is not as large a threat as Iran’s single-stage solid rocket booster the Shahab-3 which is capable of delivering non-nuclear explosive warheads and is more easily concealed from western eyes. However, any launch of a Shahab class missile against a neighbor would bring a significant and overwhelming military response. Exactly what the Iranians don’t want. If they managed to strike a target the price in retaliation would be high. Others have said that the launch is more about symbolism than substance or threat. However, we must not be naive to what can be achieved by a capability such as the Safir-2. The largest threat yet unmentioned by any reports is as an ASAT or anti-satellite weapon. To conduct this type of “terror in space” would not require a terribly sophisticated satellite only the vehicle to put it into orbit in its operational range of 150-200 miles which Safir-2 has demonstrated that it is capable of achieving. This is precisely the range that the International Space Station and the Space Shuttle operate in. An explosion or “accident” that resulted in creating a debris field at that range could severely damage the vehicles and could hamper future space operations. No one has so far speculated that the purpose of the Iranian launch was to test an ASAT capability or to create a debris field in the orbit of the Shuttle or ISS, but we have learned painful lessons over time that it is the crudest of weapons that are capable of inflicting great damage. The United States and Russian response to the Iranian launch should be one that focuses on how to jointly monitor their intentions going forward with their fledgling space program to ensure it is as they state “a message of peace and friendship to the world”. Whether the Safir-2 is the Iranian’s V-2 or the Omid is its Sputnik we don’t know, but to prevent advanced rocket technology from becoming another method of terror requires oversight and the Americans, Chinese and the Russians have a significant stake in the proliferation of weapons in space and the safety of current satellites and manned space vehicles.